Suhrawardy redirects here. For the East Bengali politician and Prime Minister of Pakistan, see Huseyn Shaheed Suhrawardy. The well-known Shahab al-Din Yahya ibn Habash Suhrawardi "the Executed" (1153 - 1191CE), the founder of Illuminationism, is unconnected and unrelated. The Suhrawardiyya (Arabic: سهروردية‎‎) is a Sufi order founded by the Sufi Diya al-din Abu 'n-Najib as-Suhrawardi (1097 – 1168 CE). It is a strictly Sunni order, guided by the Shafi`i school of Islamic law (madhhab), and, like many such orders, traces its spiritual genealogy (silsila) to Hazrat Ali ibn Abi Talib رضي الله عنه through Junayd Baghdadi RA and al-Ghazali RA. It played an important role in the formation of a conservative ‘new piety’ and in the regulation of urban vocational and other groups, such as trades-guilds and youth clubs (see Futuwwa), particularly in Baghdad. The order originated in Balak tribe in Kurdistan though it spread all over the Islamic world under its founder's nephew, Abu Hafs Umar al-Suhrawardi (1145 – 1234 CE), who was sent by the Caliph in Baghdad as an ambassador to the Ayyubid Sultan Al-Adil I of Egypt, to Khwarezm-Shah Muhammad of Bukhara and to Kayqubad I, Sultan of Rûm. The order's founder was a disciple (murid) of Ahmad Ghazali, brother of the noted thinker Imam Abu Hamid al-Ghazali, who taught Shafi'i jurisprudence (fiqh) at Al-Nizamiyya of Baghdad Academy. His surviving work is called Kitab Adab Al-Muridin - "The Book of Duty of Disciples". The founder's nephew Shahab al-Din Abu Hafs Umar Suhrawardi, author of Awarif ul-Maarif, ("The Heights of the Gnostics"), renounced reclusiveness and austerity in favour of an active life in society, maintaining close contact with the civil authorities and undertaking diplomatic missions and the political settlement of conflicts. His luxurious cloister in Baghdad, with gardens and bath houses, was built for him by Caliph an-Nasir. Sheikh Umar directed his disciple Baha-ud-din Zakariya to make Multan in present-day Pakistan the centre of his activity; and similarly his other disciple Syed Jalaluddin Surkh-Posh Bukhari made Uch his headquarters. Iltutmish appointed him "Sheikh ul-Islam" after the invasion of Multan and the overthrow of its ruler Nasir-ud-Din Qabacha. During the Mongol invasion he became the peace negotiator between the invaders and the Muslim army. Bukhari, known as Makhdum Jahaniyan Jahangasht, the world traveller, was a puritan who strongly objected to Hindu influence on Muslim social practices. The order became popular in India owing to the work of Bukhari and his successor Baha-ud-din Zakariya. Zakariya’s successor was his son Shaikh Sadruddin ‘Arif. His disciple Amir Husayn, the author of Zad- al-Musafirin, wrote several works on the doctrine of the oneness of being. Shaikh Arif’s son and successor Ruknuddin was highly respected by the Delhi Sultans from Alauddin Khilji to Muhammad Ibn Tughlaq. After the death of Shaikh Ruknuddin the Suhrawardiyya declined in Multan but became popular in other provinces like Uch, Gujarat, Punjab, Kashmir and Delhi. The Suhrawardiyya order became popular in Bengal with the arrival of Sufis to Maner Sharif. Noted Sufis of the order in Bihar and Bengal include Makhdoom Esrail Maneri, his brother Makhdoom Ismail Maneri and son Hazrat Makhdoom Yahya Maneri (also educated at Nizamiyyah at Baghdad and a murid of Shahab al-Din Abu Hafs Umar Suhrawardi), Makhdoom Shahabuddin Pir Jagjot, Makhdoom Salah Darwesh Maneri and others. Maner Sharif is still considered a center of the Suhrawardiyya order. The contemporary prominent Sufis of this order in Bihar are Dr Syed Shah Taqiuddin Ahmed Firdausi Suharwardi Nadwa Maneri (Ph.D.) (S/O Syed Shah Abu Zafar Enayatullah Firdausi Maneri) and his nephew and current Sajjadah of Khanquah Maner Sharif - Syed Shah Tariq Enayatullah Firdausi. Dr. Syed Shah Taqiuddin Ahmed Firdausi Suharwardi Nadwa Maneri (Ph.D.) is a Sufi and Ulema who studied at Nadwa, Madinah University and Azhar University. 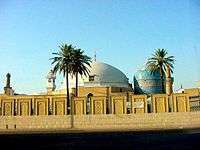 The poet Fakhr-al-Din Iraqi, buried at Konya, Turkey near Rumi's tomb and the popular Pakistani saint Lal Shahbaz Qalandar (1177 - 1274 CE) were connected to the order. Mausoleums of Table e Alam Badshah Nathar Vali and Hazrat Baba Fakhruddin's dargah are very prominent shrines of the order in India and considered as potent source of barakat. Shaikh Makhdoom Sharfuddin Ahmed Yahya Maneri (S/O Hazrat Makhdoom Yahya Maneri (d. 1380 AD) belonged to the Firdausiyya order, a branch of Suhrawardiyya. He compiled several books, i.e. “Fawaid al-Muridin”, “Irshadat al-Talibin”,”Rahat al-Qulub”, etc. ↑ Muḥammad Kamāl, Mulla Sadra's Transcendent Philosophy, Ashgate Publishing Inc, 2006, ISBN 0-7546-5271-8, p. 12. ↑ Susan Bayly (22 April 2004). Saints, Goddesses and Kings: Muslims and Christians in South Indian Society, 1700-1900. Cambridge University Press. pp. 137–. ISBN 978-0-521-89103-5. Chopra, R.M., "GREAT SUFI POETS OF THE PUNJAB", 1999, Iran Society, Calcutta. Chopra, R.M., "SUFISM", 2016, Anuradha Prakashan, New Delhi. ISBN 978-93-85083-52-5.